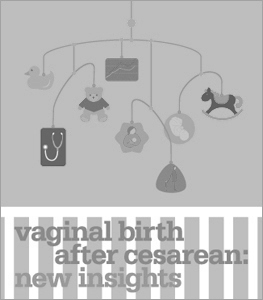 The NIH Consensus Development Program offers continuing education credits for reviewing the final panel statement on Vaginal Birth After Cesarean: New Insights. If your preferred credit type is not listed below, please check to see if your credentialing body will honor other credit types. If you have any questions, please don't hesitate to contact us. This activity has been planned and implemented in accordance with the essential areas and policies of the Accreditation Council for Continuing Medical Education through the joint sponsorship of the Centers for Disease Control and Prevention (CDC) and National Institutes of Health (NIH) Office of Disease Prevention. CDC is accredited by the Accreditation Council for Continuing Medical Education (ACCME®) to provide continuing medical education for physicians. CDC designates this enduring education activity for a maximum of 1.25 AMA PRA Category 1 Credits™. Physicians should only claim credit commensurate with the extent of their participation in the activity. CDC is accredited as a provider of continuing nursing education by the American Nurses Credentialing Center's Commission on Accreditation. This activity provides 1.0 contact hours. Sponsored by CDC, a designated provider of continuing education contact hours (CECH) in health education by the National Commission for Health Education Credentialing, Inc., this program is designed for certified health education specialists (CHES) to receive up to 1.0 Category I CECH in health education. CDC provider number GA0082. The final panel statement for the National Institutes of Health (NIH) Consensus Development Conference: Vaginal Birth After Cesarean: New Insights was prepared by an independent panel on the basis of a systematic literature review, expert presentations, and audience commentary (consensus development panel, speakers, and planning committee are listed in the statement). Widely distributed to the biomedical community and covered by the news media, the statement will help inform healthcare providers and the general public, and shape the research agenda for this complex topic. It also will enable pregnant women with a prior transverse uterine incision to make informed decisions about trial of labor versus elective repeat cesarean delivery. Outline the rates and patterns of utilization of trial of labor after prior cesarean, vaginal birth after cesarean, and repeat cesarean delivery in the United States. Discuss the vaginal delivery rate and the factors that influence it among women who attempt a trial of labor after prior cesarean. Describe the short- and long-term benefits and harms to the mother of attempting trial of labor after prior cesarean versus elective repeat cesarean delivery, and what factors influence benefits and harms. Discuss the short- and long-term benefits and harms to the baby of maternal attempt at trial of labor after prior cesarean versus elective repeat cesarean delivery, and what factors influence benefits and harms. Explain the nonmedical factors that influence the patterns and utilization of trial of labor after prior cesarean. Identify the critical gaps in the evidence for decisionmaking and the priority investigations needed to address these gaps. View the final panel statement "NIH Consensus Development Conference on Vaginal Birth After Cesarean: New Insights" at consensus.nih.gov/2010/vbacstatement.htm. After reading the statement, go to the CDC Training and Continuing Education Online (TCEonline) website at cdc.gov/tceonline. You will need to be registered at TCEonline to proceed. First-time users will need to complete the registration process. Returning users should select "Participant Login." Under "Keyword Search" enter SS1784 for the course number. Click on the course title at the bottom of page. Then select the type of continuing education credit you want. After submitting a few demographic questions, you will be routed again to the "Participant Services" page. Select "Evaluations and Tests." Then select "Self-Study Courses." Complete the evaluation and the posttest. The course will be entered into your personal transcript and you will be able to print a certificate of completion. If you have any questions or problems, please contact CDC Training and Continuing Education Online at 1–800–41TRAIN or 404–498–6260, or ce@cdc.gov. In compliance with continuing education requirements, all conference presenters had to disclose any financial or other associations with the manufacturers of commercial products, suppliers of commercial services, or commercial supporters, as well as any use of unlabeled product(s) or product(s) under investigational use. F. Gary Cunningham disclosed a financial interest/relationship with McGraw-Hill Publishing. Thomas Dean disclosed a financial interest/relationship with Horizon Health Care. Miriam Kuppermann disclosed a financial interest/relationship with Boehringer Ingelheim Pharmaceuticals, Inc.
Emily Spencer Lukacz disclosed a financial interest/relationship with Intuitive Surgical; Proctor & Gamble/Novartis; Pfizer; Elsevier, Inc.; and Watson Pharmaceutical. Adele Viguera disclosed a financial interest/relationship with the Epilepsy Foundation, National Alliance for Research on Schizophrenia and Depression, Harvard Medical School's Scholars in Medicine, Fellowship Award (Clafin Award), Stanley Medical Research Institute, AstraZeneca Pharmaceuticals, Bristol Meyers Squibb, Forest Pharmaceuticals, GlaxoSmithKline Beecham Pharmaceuticals, Janssen Pharmaceuticals, Pfizer Pharmaceuticals, and Wyeth-Ayerst Pharmaceuticals. The content does not include any discussion of the unlabeled use of a product or a product under investigational use. CDC does not accept commercial support.